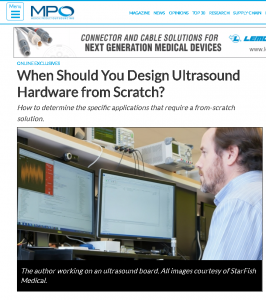 MPO Mag: When Should You Design Ultrasound Hardware from Scratch? The January 29, 2019 online edition of Medical Product Outsourcing (MPO) magazine features When Should You Design Ultrasound Hardware from Scratch? written by Kenneth MacCallum, Principal Engineering Physicist, StarFish Medical.